Posted July 26, 2017 by admin & filed under Featured Inner West Independent, Inner West Independent. Commuters in Sydney’s Inner West are drawing the short straw, as the rate of bus crashes in the area skyrocket, while solutions to choked roads and poor public transport infrastructure are scrapped by the state government. 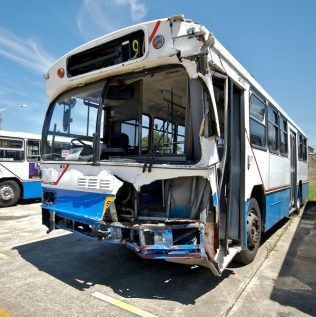 Recent data from State Transit reveals that collisions with buses are occurring at a rate of two crashes per day in Sydney’s Inner West. Of the total 827 crashes in the past year, 17 resulted in an injury to a customer, employee or member of the public. According to a spokesperson at State Transit, in the majority of these crashes, a third party was at fault. Parramatta Road has been a known crash spot for years – yet, despite the surge in crashes, and the impending WestConnex road widening, which will increase car numbers on the already clogged M4, the NSW Government’s months of light rail planning are set to become nothing more than a broken promise. The proposed light rail could have potentially reduced traffic congestion, and given dissatisfied bus customers an alternative mode of transport. But according to a spokesperson for Transport for NSW, only preliminary assessments of the light rail were carried out, which later ruled out the project entirely. “Only very early assessments of this potential approach were carried out and it has never been considered by Government,” they said. A spokesperson at the Inner West Council said that a tram system on Parramatta Rd would have significantly eased congestion in the area. “A game changing public transport such as this is needed to achieve the sort of urban renewal which is proposed for Parramatta Rd,” they said. Dr Mehreen Faruqi, NSW Greens MP and Environment spokesperson, said that that the state government’s failure to deliver the light rail on Parramatta Rd could worsen a public transport system already fraught with problems. “Scrapping the much needed Light Rail Project on Parramatta road in favour of the wasteful WestConnex is yet another reminder of this Government’s obsession with toll roads. This is outdated and dangerous infrastructure which will not solve Sydney’s transport problems. “Rather than alleviating congestion in the inner west, WestConnex will pump much more traffic on roads which are already struggling to cope,” she said. As tensions rise amidst revelations that the NSW Government plans to privatise the Inner West bus line, a petition against bus privatisation has received more than 10,000 signatures. According to Dr Faruqi, the privatisation of the bus network would significantly worsen congestion problems. “This Government is more interested in flogging off public transport to private operators, not solving Sydney’s traffic congestion. “We know that privately run public transport is a disaster – you see the loss of routes, stops skipped and less services which disproportionately affect vulnerable people who rely on it, like the elderly and the unemployed,” she said. With hopes that the new light rail could ease traffic congestion now crushed, a once feasible solution to a public transport system fraught with problems is pushed further away.